Browns players, alumni, staff spend day providing meals to those in need. Browns players had the day off Monday, but they still did plenty of heavy lifting. Only instead of weights, they were hauling frozen turkeys and sacks of potatoes. 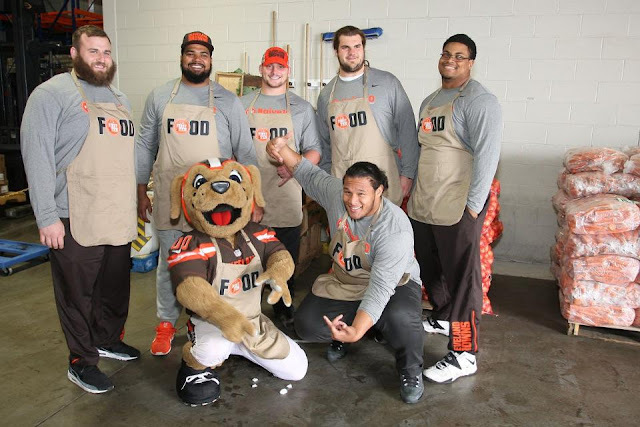 In one of the Browns First and Ten program’s biggest events of the season, a long list of Browns players and alumni came out to the Greater Cleveland Food Bank to help distribute meals leading up to the holiday season. Dozens of players and alumni contributed to the cause – either financially or through in-person service. Those who volunteered in-person included: Johnson Bademosi, Joel Bitonio, Ibraheim Campbell, Pierre Desir, John Hughes III, Erle Ladson, Johnny Manziel, Jamie Meder, Barkevious Mingo, Austin Pasztor, Danny Shelton, Scott Solomon, Dylan Wynn and alumni Keith Baldwin, Roger Chanoine, Kevin Mack, Greg Pruitt, and Cleo Miller. The visit was particularly meaningful for defensive tackle Jamie Meder, a Cleveland native. “It feels great to give back to my city,” he said. “I’m part of it – I’m from Cleveland. I bleed Cleveland." Meder and his teammates spent the day loading up vans for the food bank’s partner agencies, who will, in turn, distribute the food to those in need. Typically, those partner agents are volunteers who load up their vehicles on their own. Not Monday, though, as they had a team of NFL players eager to haul hundreds of frozen turkeys and mountains of fresh produce. "Having the Browns come out here today is great,” said Karen Pozna, Communications Director for the Greater Cleveland Food Bank. “It’s such a busy time of year for us, any extra hands are much appreciated." The Greater Cleveland Food Bank is a partner of First and Ten, with the two having collaborated on events like the Taste of the Browns, the First and Ten Food Drive and others. On Monday, that collaboration continued with a long list of players and dozens more team staff volunteering. “This is just one more opportunity for us to work with them,” Pozna said. “It’s great to see such a committed organization to help fulfill a need." With more than 800 partner agencies across six counties – and with a variety of programs – the food bank provided enough food for 45 million meals last year. Pozna said Monday’s volunteers did work that will help feed thousands across the area. And it wasn’t just the Browns, either. As part of the Browns youth football outreach, players from Glenville High School also participated in the event alongside the Browns players. Their camaraderie was on full display while volunteering. “They’re obviously pretty close knit,” rookie safety Ibraheim Campbell said. “They were joking on each other, and it was cool to be around. I haven’t been around a high school team in a while." The Browns players also flashed some chemistry during Monday’s event. Meder’s group, in particular, had a blast – whether it was Danny Shelton pretending to chomp down on an ear of corn during a photo opportunity or the guys setting out to break a speed-loading record. “We were having a lot of fun, trying to load up as fast as we can and break whatever record we thought existed,” Meder said. “We definitely set the new record, for sure."